Leftover corn-on-the-cob is fun! Who knew!! This time I combined it with avocado, cherry tomatoes, french feta (but you could use regular feta or any crumbly cheese you like), fresh basil, fresh cilantro, pine nuts and lime juice. Fresh, sweet, salty, tart. Very nice indeed. I didn’t add any oil as a dressing, because I think the avocado serves that purpose. And the cherry tomatoes from the farm have been sweet as candy, so between those and the corn, I didn’t feel I needed to balance the lime juice with any extra sweetness, but you could always add a drizzle of honey. You could also add roasted garlic, hot sauce, or any other thing you like. Here’s Whispering Grass by The Ink Spots. Cut the ears from the corn with a large knife. Don’t worry about them becoming individual kernels, little rafts of corn are nice. Add all of the other ingredients and mix gently. If your tomatoes are very tart, add a drizzle of honey. Season well with salt and pepper, and serve. 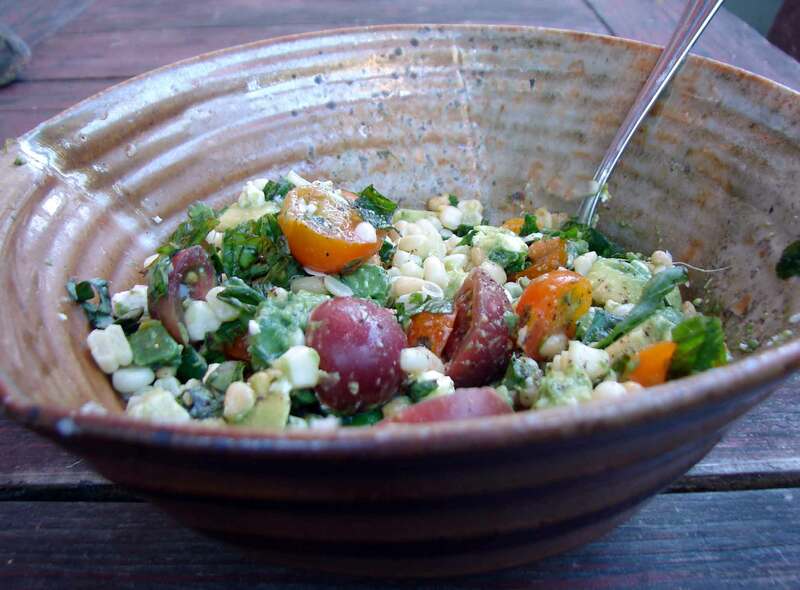 This entry was posted in recipe, salad and tagged avocado, french feta, guacamole, leftover corn on the cob, salsa by Claire. Bookmark the permalink. Isaacstentialism! Isaac’s vision might just come true. It will, if grown-up Isaac holds tight to his Little Kid Dreams. In the meantime, tell him to come visit Yan Jing’s Meadow where he may find some Praying Mantis and a turtle, the one I saw the other day. The turtle I believe might be the one Malcolm and David rescued from the road and brought here several Christmasses ago. Or several Boxing Days ago, that is. Oh, I’d love to believe the turtle is still there!! We had a toad in our yard for a while with a wounded foot, we called him Napolean Artaud. I haven’t seen him in years, though, and I miss him! !